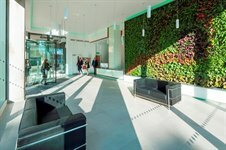 Following completion of the comprehensive refurbishment of the main reception at CI Tower, which included the installation of a unique living green wall, Cattaneo Commercial are pleased to confirm they have secured a letting of a 10th floor office suite comprising 2,417 sq ft. The entire first floor, comprising 5,370 sq ft was also recently let. The fully refurbished 12th floor is now available to let comprising some 5,370 sq ft and suites of 1,025 and 2,885 sq ft are shortly to be available. Fur further information please contact Andy Armiger on 020 8546 2166.